One of the TK teacher’s asked for something she could put on her bulletin board for January. At this point, I was just about “snowmanned” out so I came up with this simple self portrait with a winter hat. I used it for both our TK and Preschool students. I think they did a terrific job and it is perfect for a January bulletin board. I did a simple and quick directed drawing of the eyes and forehead. I demonstrated a couple of shape options for the brim and hat and they did the rest. Students were encouraged to put lots of color and pattern into their hats. Third graders learn about our solar system and planets as well as animals. This seemed like a good way to incorporate both science and nature. We discussed the aurora borealis and aurora australis and students created images of their favorite arctic animals. The kindergarten team asked for a snowman picture so we did snowman families. 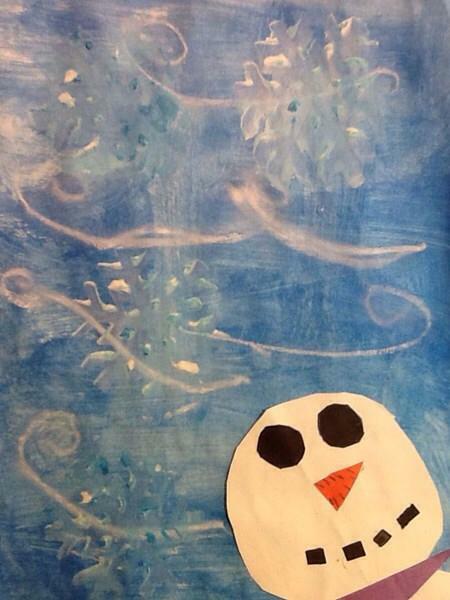 Students were encouraged to create their families as if they were snow people. 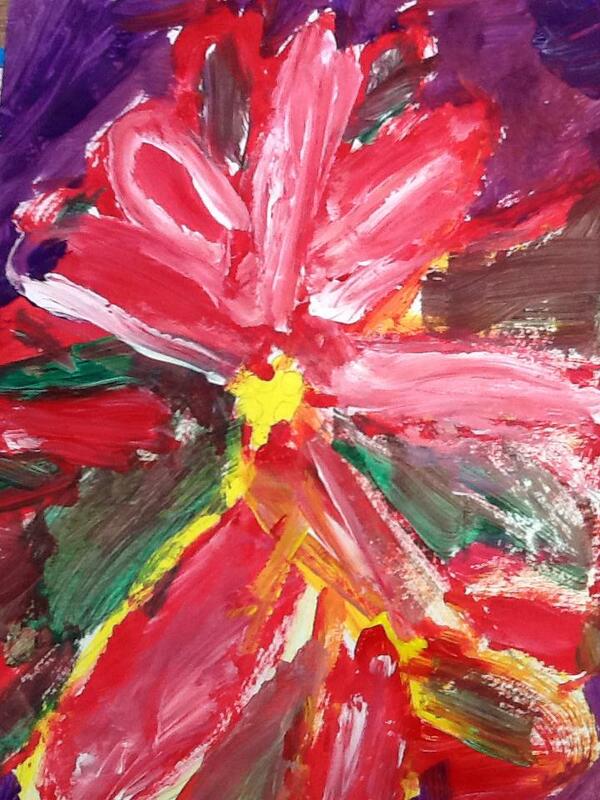 The students drew a quick outline of three stacked circles then used paint for all the details. 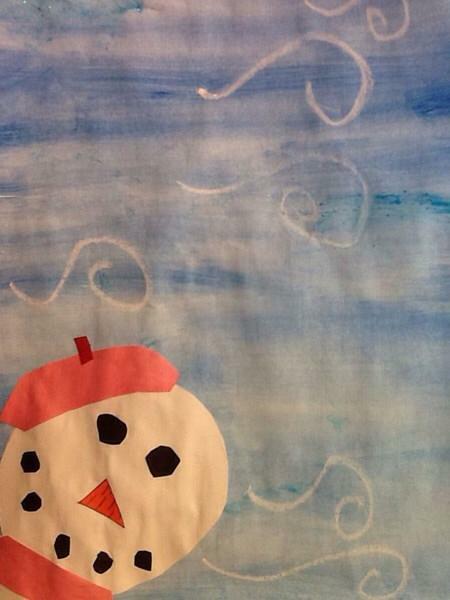 My first grade students were shown several different ways to create a snowman. We talked about what it would look like from the front, the side, close up, behind, etc. They chose the perspective view they wanted and created these images using black crayon and tempera paint. This was a fun project for my fifth grade students. They love the autonomy of creating things that are their own design. I just gave them some parameters-must be winter, use the supplies given and here is the paper substrate. 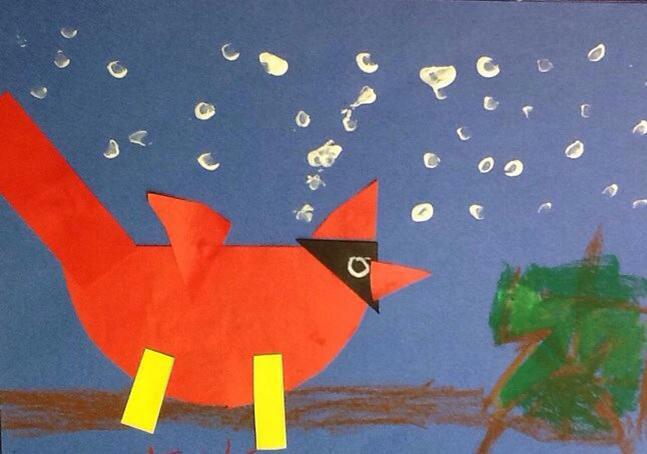 They created these winter collages of their own design. I think they are really lovely. One of the teachers sent them home as a winter gift for their parents. She just added a bow to the top. 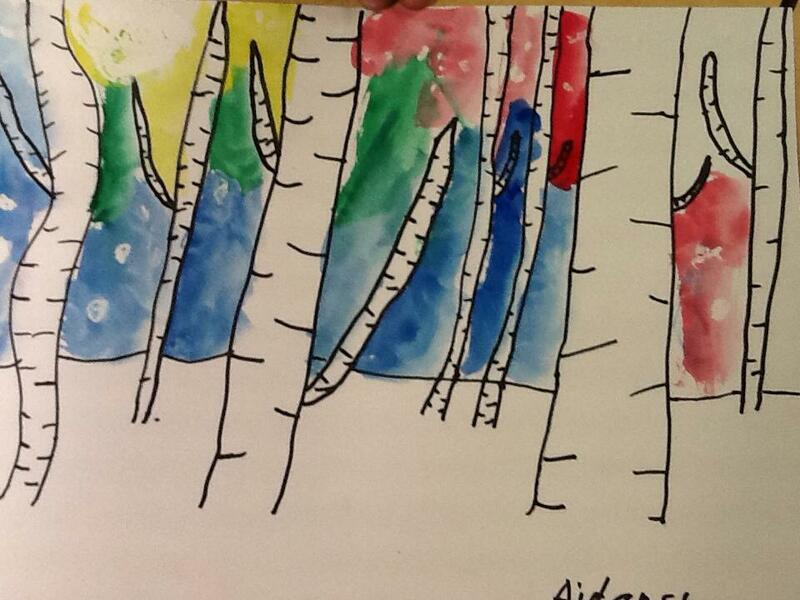 I have seen many variations on winter trees and this is what I did with grade 4. I demo’ed how to create different backgrounds-gradated colors, blended colors, tints and shades. 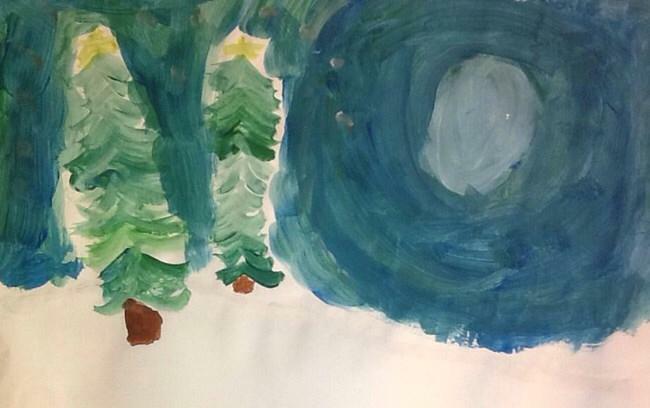 They painted a background of their choice in tempera. Once they were finished, I demo’ed different types of winter trees. Then they added trees to their backgrounds. I did this lesson with 5th grade. I wanted something winter and something fun. They created a background of their choosing then added a snowman collage to the top. I like all the colors and layers to this. They had lots of fun creating. My K students are a lovely creative bunch! I like to give them lots of opportunities to use scissors. 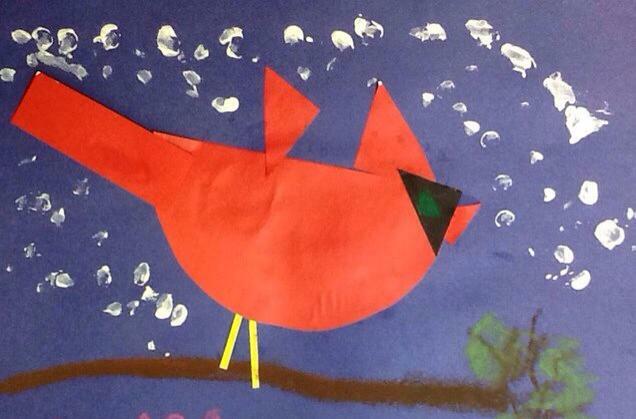 We did these cardinals last week. One of the aides, helped draw a half circle on some scrap red paper I had. I gave them additional pieces of black, yellow and red. They drew the branch in oil pastel, added the collage with some direction from me and then added dots of paint with a q-tip. I love the vibrant red on the blue paper. I did this lesson with Grade 1. 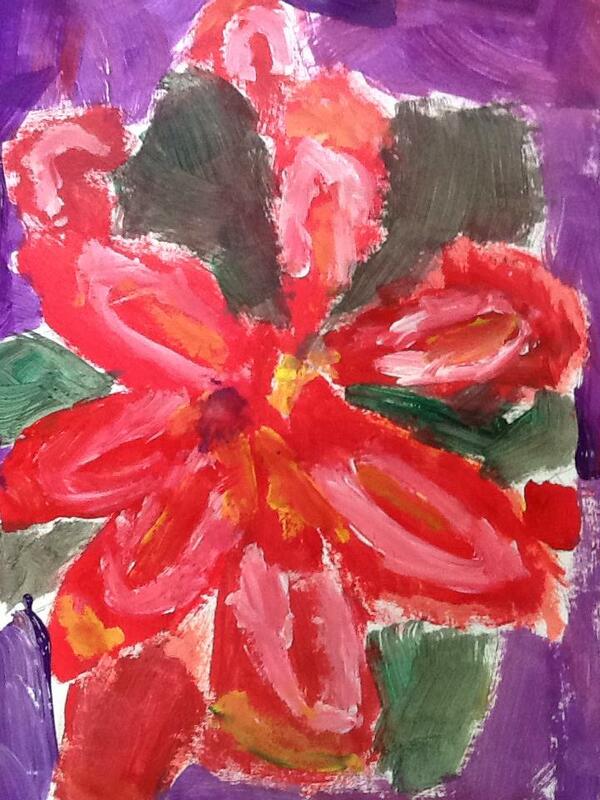 I talked about the poinsettia, showed them how to draw large petals in pencil and let them do the rest. We also discussed Georgia O’keefe. Another old lesson that I updated for my new school. I did this originally about 7 years ago with my daughter’s 4th grade class. I think I originally saw it in Arts and Activities Magazine. I did this lesson with 5th grade. Changed the medium to water color and marker, added a resist option. Students could do a blue sky, sunset sky or aurora borealis sky. I think they are pretty good.